The true heat of summer is clearly here in St Paul, which means wasps have come out of hibernation and are more active than ever. Now in full force, they can be a nuisance around your home or work! Do not let them ruin your outdoor summer festivities. Contact Eco Tech today for help with your wasp problem. We can wipe out your wasp infestation in just one application! Wasps have the potential to sting multiple times, different from bees that can only sting once, causing burning, redness and inflammation. Wasps and Bees can even cause a severe life-threating allergic reaction known as anaphylaxis. Aside from the fear of being stung, you also have to deal with the constant humming and buzzing and the sight of the winged creatures swarming around your garden. If you have wasps lingering around your home, now is the time to get rid of them and protect your family. A Wasps nest may be built out in the open but commonly they prefer to place their nests in small cavities, such as rain gutters, plumbing vents, bird houses, mailboxes, window ledges or hollow logs and trees. Prevention of the nest construction is key! Put an end to your pest problem today and follow our easy 4-step process! Give us a call at the first sign of a wasp or nest! 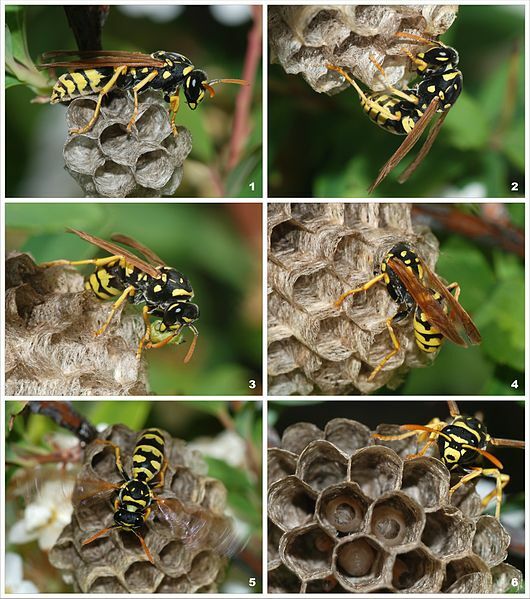 One of the easiest ways to locate a nest is to wait until dusk and observe the wasps’ flight pattern. This will often lead you to the area of their dwelling. If you do come across a nest, be sure to contact Eco Tech right away! Our highly trained team member will come out to inspect your property and give you a quote! There are three main types of wasp that our team member will likely find – paper wasps, yellow jackets or hornets. We will work together to pick a date that best fits your schedule to eliminate your wasp problem with our easy one application process. Once the wasps are eliminated, we can begin to repair any damage that may have been caused to your property! We back all of our services with a four-year warranty! You have nothing to lose but those pesky wasps! Summer is the best time of year for outdoor barbeques, picnics and gatherings. No one wants to be swatting away wasps from their burgers. Nor does anyone want to worry about a potential sting while picking fresh vegetables from the garden you have worked so hard to grow. Call Eco Tech today to help with your wasp issue and enjoy the summer wasp free! For wasp extermination in the St Paul area, call Eco Tech today at 763-785-1414 or schedule exterminator service online.